When you hear the phrase “third largest cause of greenhouse gases”, what comes to your mind? Fracking? Carbon dioxide emissions? Nuclear power-plants? Of course, these have an impact on the environment but it’s actually food waste that holds the bronze medal in greenhouse gas emission. In fact, “6.7% of all global greenhouse gases come from food waste” according to the UN Food and Agriculture Organization. So why should this matter to you and your restaurant? Food waste is not an issue limited to third world countries, it’s an issue across the globe, and influences your bottom line. Food wasted in your restaurant leads your managers having to order (and spend) more. Food waste slips the average consumer’s mind because it’s just food, it will break down in a landfill wherever it ends up, right? Wrong! Most landfills become anaerobic because large volumes of trash are crammed tightly together, making it impossible for waste to decompose. Because it’s not able to decompose, food waste primarily emits methane gas, especially meats like beef and lamb, for longer periods of time. The irony of food waste is a double-edged sword. While restaurants are busy throwing out food, many people aren’t getting the proper nutrition they need. Food waste happens in a variety of ways in different countries, but it is a shared fault of all global communities, regardless of wealth or status. In the US, 62 million tons of food are wasted annually and $218 billion are spent growing, processing, and transporting wasted food. To make matters worse, food waste happens in some shape or form at almost every stage in its lifecycle, stretching resources very thin. In total, global food waste eats away at “19% of fertilizer, 21% of all fresh water, 18% of cropland, and 21% of landfill volume” throughout the growing, production, and consumption processes. 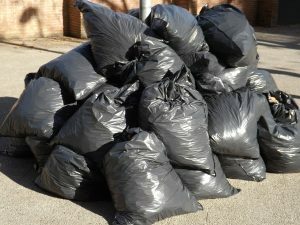 Of the 62 million tons wasted, about 10 million tons are from unharvested or thrown away food on farms, with the remaining 52 million tons sent to a landfill. The numbers are staggering to know how much is wasted, but it’s even more concerning that one in seven Americans are food insecure. Per the USDA, food insecurity is “a household-level economic and social condition of limited or uncertain access to adequate food”. Food security continues to be a very real issue, even though 1.3% of the American GDP is spent on food waste. In a world where resources are shrinking, now is the time for foodservice industries, farms, production facilities, and end users to take action. So what can restaurants do to help? Here are some tips to help reduce your carbon footprint and use your food wisely. Knowledgeable ordering– Prevent food waste before the food even enters your kitchen! Food waste is not only costly to the planet; it hurts your bottom line. Proper staff training, up to date recipe cards, and a weekly inventory check can lead to effective food ordering. Portion sizes– Calculating how much food goes into each menu item and stick to them can reduce future orders of food that are unnecessary. Compost– Decomposing produce is the perfect nutrient for your onsite herb garden, turning your food waste into a food win! If you don’t have the space to run your own garden, help local farming or gardening efforts with your compost. 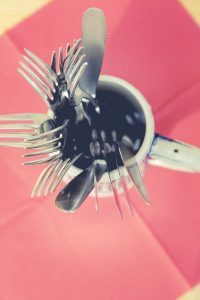 Donate– Many communities have started grassroots movements to reroute potential wasted food with needy parties such as senior centers or homeless shelters. These organizations make sure the food is in good condition and not wasted. Restaurants are also able to write off the cost of the food as an itemization on tax forms. You will need to calculate whether it’s more worth it for your business to give up its standard deduction in favor of itemized deductions. The less food your restaurant wastes, the less money you will see piling up in a landfill. Food waste will continue to be an issue for those in the food service industries if the proper steps aren’t taken. Being smart with food orders, menu portion sizes, compost efforts, and donation centers are crucial for sustainably operating your restaurant while also keeping in mind your bottom line. By taking steps to lessen food waste, your restaurant can make a significant impact on its community. The rustic industrial design trend has been a favorite of restaurateurs for a while now but our Turnbuckle Table is here to shake up your décor, no matter the theme. So what is it about this table that makes customers stop and stare when they enter your dining room? Meet the turnbuckle, a mechanism that can expand and contract table legs. Traditionally, turnbuckles were used to sturdy the legs of old workbenches and is made up of two threaded eyebolts. One of these screws into each end of a small metal frame the other separates into a left-hand thread and right-hand thread. Turnbuckles are used to adjust the tension between cables or ropes. This tension is altered by rotating the frame, simultaneously screwing the eyebolts in and out, without twisting the eyebolts or attached cables. Other uses for turnbuckle engineering include construction, aircraft, shipping, sports, entertainment industry, pipe systems, and now, restaurant furniture design. Turnbuckle tables are especially popular in restaurants that have a very homey feel to provide contrast. Reminiscent of the workbench look, the combination of metal accents and vintage wood come together for an industrial feel in breweries, farmhouse-style restaurants, and coffee shops. 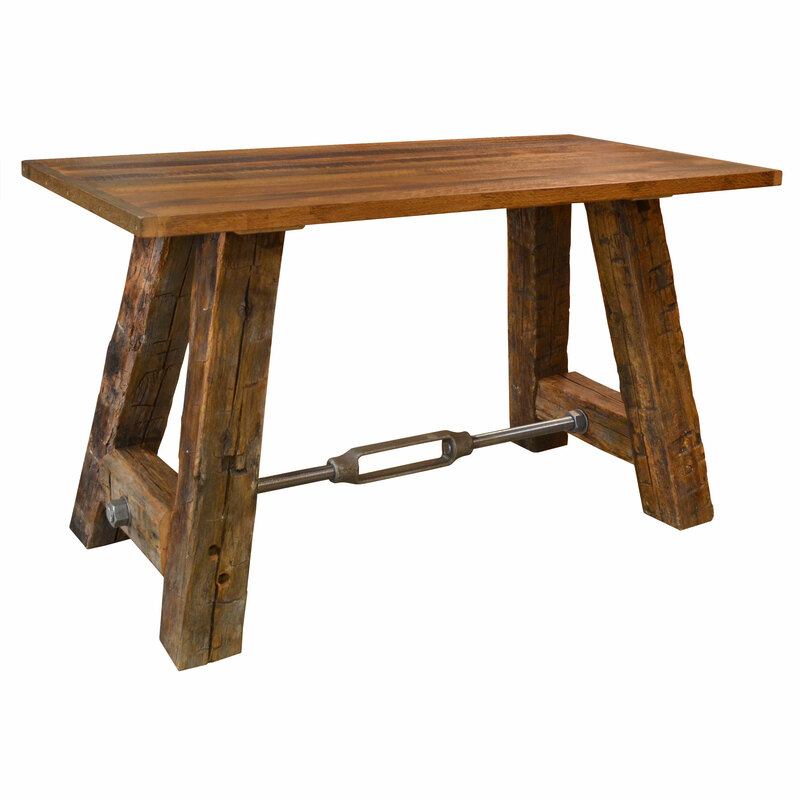 This turnbuckle table is made of reclaimed oak wood salvaged from vintage barns. Each table top is fully sanded and sealed with a heavy sealer to preserve the rustic elements that come with weathered wood. 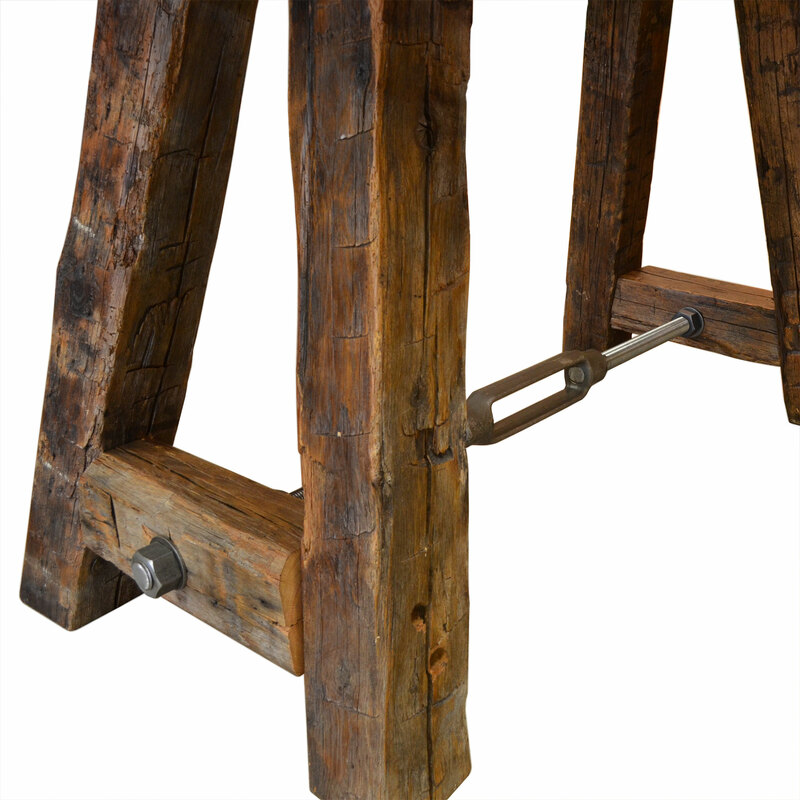 A steel turnbuckle connects the hand hewn, wood beam legs that is functional as well as aesthetic. Make this table all your own by choosing one of our three finishes: Natural Reclaimed, Antique Black, and Whitewash. Custom edging and additional premium finish options are also available. When looking at purchasing restaurant chairs, weight limit might not be the first qualification that comes to your mind but that doesn’t mean it isn’t important. Your customers will also appreciate your research as they will be the ones using the chairs. Technically, commercial furniture manufacturers can advertise whatever weight limit they want. As a consumer, you have to be careful not to be taken in by large weight limits that don’t really mean what you think. For example, there are chairs on the market that have a weight limit of 1,000 pounds, but they are tested using “static” weight, which means a load that is placed onto the chair and does not move. Think of gently placing 100 pound bags of concrete on the chair one by one until the chair fails. If the chair fails after 100-pound then the manufacturer can say that the chair is weight rated up to 1000 pounds. In a real life, weight is not static. When is the last time that you saw a customer gently sit on a chair and not move? It just doesn’t happen. Customers adjust, reposition, rock back on the legs of the chair, and worse; in other words, their weight is constantly moving or dynamic. 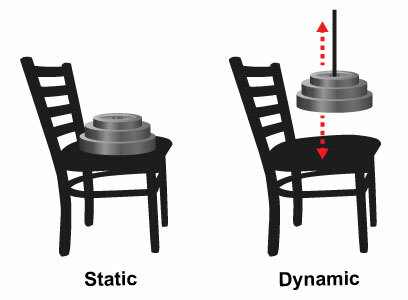 A chair that will support a 1,000 pound static load will only support a much lower dynamic load: probably even less than half as much. So, what is the weight limit of most commercial furniture? The short and sweet answer to this question is that the industry standard for most commercial chairs is 250 pounds. That doesn’t mean that is the highest weight that they can support, but it is what they are tested for. One standardized way of testing a commercial chair is to get it tested by the Business and Institutional Furniture Manufacturer’s Association, known as BIFMA. BIFMA creates the industry standards for commercial furniture. They offer a series of standard tests to rate the weight of a chair. Most BIFMA tests are designed to measure dynamic weight. For example, the seating impact test consists of dropping a 125 pound weight onto the seat from a height of 2 inches for 100,000 cycles. The chair must maintain its integrity and serviceability throughout the test in order to pass. The series of BIFMA tests are meant to mimic a weight load of around 250 pounds, which is why that has become the industry standard. Most manufacturer’s choose to go with the 250 pound weight limit whether they have actually had their chairs tested according to BIFMA standards or not. Chairs that have been BIFMA tested could have the potential to hold more than the 250 pounds; BIFMA explains this further in their memo on chair weight limits and load ratings. They actually recommend not purchasing strictly based upon load-rating claims as they are not indicative of the life or strength of the chair. You likely have patrons of all shapes and sizes, so it is important to find chairs that can support them. Next time you’re in the market for restaurant chairs, you’ll now know what the weight rating is, and how manufacturers arrive at that number.